What’s that you say? Never heard of it? I hadn’t either until this morning; it was officially introduced in the early 1990’s by M. Hirsh Goldberg as a way to honor the honorable and encourage honesty. He selected this day because “April begins with a day dedicated to lying (April Fool’s Day) and it should end on a higher moral note.” (see source below) Interesting thought, eh? It’s another glorious day outside – sun shining, light breeze blowing and the thermometer shows 82 degrees F.! I ‘should’ be sitting out there enjoying the sunshine but can’t seem to muster up the energy quite yet. Why, you ask? Well, this here Pammie decided today was the day to drag out all the bags & boxes of knit squares to assemble more for afghans. Got five more ready to sew together and am slowly knitting the little pockets for each afghan. Upon completion of that task I stopped to look around at all the various bags/boxes and the mess I’d created, which caused me to re-think my being ‘done’. Recently I was gifted with a large batch of yarn from someone who needed to clean out their dwelling; most of the yarn came in two large cardboard boxes. I have finally been able to sort the yarn, keeping some and giving most of it away to the ladies in my knit group but as for the boxes – my dear cat had decided that they were meant just for him as a nice place to sleep on and be above the floor. This has gone on now for about 2 1/2 weeks but just recently he’s given up ‘the perch’ to take up his former sleep space (the end of the couch). Long story short: I put those 2 big boxes to great use in holding my knitted squares, thus freeing up at least two smaller boxes and at least 3 good-sized bags. Storage for the squares is much neater now and I was also able to drag out a large box of wooden blocks which my grandson will love playing with (they were sort of stored behind the previous yarn boxes in my son’s room). 5 afghans assembled, huge knit square ‘mess’ neatened up (is that a word? ), blocks out for playing – feel like I’ve done a good day’s work! Dinner is breaded & fried pork steaks, probably mashed potatoes and tossed salad. Tomorrow is baking snacks for our Sunday School class; this time it’s the same recipe I posted a few blogs back (Better Than Anything Cake) and a carrot cake (am going to add a drained can of crushed pineapple and some chopped walnuts to it). I try to make one sweet dessert and one that’s not so sweet, for a variety. It’s supposed to storm tonight and tomorrow so I’d better get outside for a little while and enjoy it while I can. Just started on another Vince Flynn novel (Transfer of Power) and it’s a goodie – time to grab my sunhat and book and head outside! Today is another of my ‘lots of little errands’ days: get gas in car, visit library, stop at Krogers and … buy a new ‘turtle’ sandbox for my grandson. The one we have was a ‘freebie’ 2 years ago and it still works but the lid has become brittle from being in the sun. I checked our local KMart and they finally have them in stock so I stopped by to pick one up. To my amazement, the ones they now sell are smaller! Yes, they’re in the shape of a turtle and they’re green but would hold about 3 bags of play sand, as opposed to my current one that holds around 7-8 bags (maybe a bit more). While trying to decide I spotted the perfect sandbox (see above photo): tan molded plastic, shaped in a big rectangle WITH lid! Since they were stacked together AND stuck quite tightly I asked a very nice gentleman employee to pry one loose for me. He even volunteered to carry it up to the checkout. While we were trudging through the store he said: “Wait, I’ll just scan that ahead of time” (he had a hand-scanner with him). When the price showed up he said: “Whoa! That’s high! $79.99!” I took one look at him and said: “I don’t know about you, but I’m NOT paying that much money for a sandbox!” He agreed and we put it back. He even nicely scanned the small turtle one for me and we were both in for another shock: “$29.99!” After profusely thanking him for all his assistance, I bought a beautiful soft pink “non-stop Tuberous Begonia” hanging flower basket for outside and came home. The begonia is great; I bought one last year and was greatly pleased with it: it’s a NON-STOP flowering plant, therefore we had gorgeous flowers all summer! Now THIS was a great bargain: $11.99 for flowers ALL SUMMER! I’m going to nicely tell my dear grandson that we can just use thesandbox we’ve got; it still works just fine even though the lid is ‘going’, and that’s just what we’ll do. There are a lot more things I could do with $80.00; just can’t justify spending that much – what you YOU pay? On another note, last night was the deadline for my Knit Group ladies to turn in their 10 X 10 inch squares for the afghan we’re all making for our friend. Still have three ‘hold-outs’ who need another week to finish, but when they hand them in next Tuesday we will have enough to make a perfect size: 5 squares wide (50 inches) by 6 squares long (60 inches). The squares are all unique, like their makers and the various textures, designs and colors will blend together wonderfully – I know she will cry when she sees it. I clued my ladies that when I’m done putting it together THEY will get an email saying to show up at our meeting to give her the afghan BUT the receiver will get an email from me saying we’re having a SUPRISE meeting and if, by chance, she should contact any of them, just act like they have no idea what the surprise is about – sneaky, eh? Right now she’s in a tizzy with all the paperwork plans, closing, packing/moving, one of her daughter’s proms, graduation, graduation party, etc. so I’m really hoping to get her to attend the meeting when we give her the completed afghan. That’s the “Plan” – sure hope it works! Finished afghan #243 yesterday and have two more 12 inch squares to go to ‘match Momma’s challenge’ of 12 squares each for the Huron Valley Optimist’s Club’s Magic Hugs Squares. If you recall, my dear friend “Momma” (Mary) crocheted 12 squares for this, drove over to our house and delivered them (see past blog) and I was left with the “thrown down gauntlet” challenge of meeting her 12 squares with 12 of my own. I was working on one of them at last night’s Knit night and the ladies were intrigued with this new charity idea. I told them that I’d give them a breather before asking if they, too, want to participate in knitting or crocheting one or more 12 x 12 square for this project. My ladies love a charity challenge, so we’ll see how that goes a bit later. 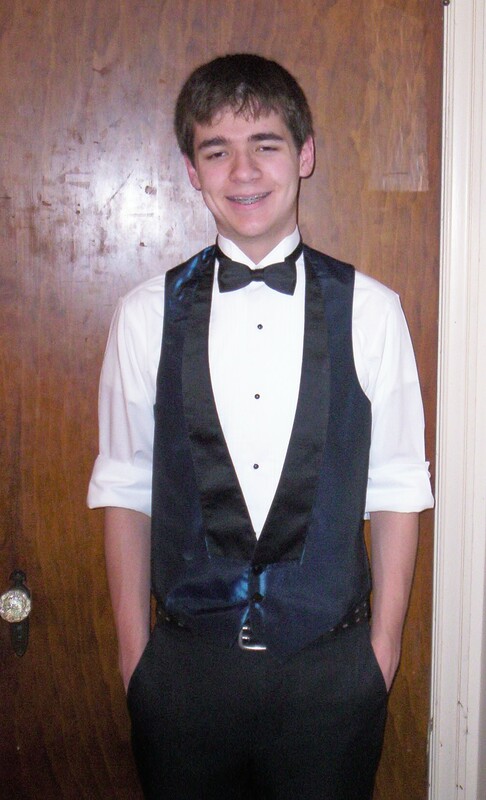 Youngest son competed in the State finals for his high school choir group yesterday and they got “2” ratings (they were hoping for 1’s, which is top score). There are 21 young people in his chamber group and I was surprised when, while chatting with my ladies at Knit Night, his choir group waltzed through the doors for dinner! I knew they were going to stop somewhere for dinner afterwards, but had no idea it would be at MY Panera Bread – neither did he! Of course, my ladies were all agog – THAT’S your son?! He’s a cutie! They had even planned to do an ’embarrass him/me’ thing after wards by whistling, waving and yelling his name and BYE! to him as the group left, but thankfully, they didn’t (I would have crawled under the tables!) When I talked with him at home later I relayed their comments on his appearance; he said he found it a bit disturbing that older ladies would think he was a cutie/hottie (their words) . . . I have to agree with him; hey! I’m his MOM and I found it a bit unusual. Oh well . . . sigh. The photo below was taken when he still had his braces on – they’re off now and he does look more ‘mature’. The girls wore floor-length midnight blue satin dresses and the guys had black slacks & shoes, white dress shirts with the same color vests (that had black lapels and black bow ties). He’s into rolling up his sleeves so this photo was ‘after’ a past concert when he did ‘his thing’ with the sleeves. It’s another great Spring-like day – sunny and in the mid 50’s, slight breeze, flowers in bloom everywhere. Enjoy your day! Sometimes it’s just nice to be able to enjoy an unexpected break from the ‘norm’ and today I’m able to take advantage of this. It’s a quiet, rather gloomy/rainy Sunday afternoon and I’m just finishing up a few odds and ends of jobs before allowing myself a brief nap! Yep, right smack-dab in the middle of the day I’m going to plan to take a nap. It’s one of those things you’d think I’d take full advantage of more often, being I’m now a stay-at-home Mom, but it’s a rarity that I actually do. I’ve learned (in my ‘old’ age) that if I stay up too late the night before, my eyes really hurt the next day (ie: really dry and itchy). You’d think I’d ‘learn’, right? Nope, just like a little kid who’s afraid they’re going to ‘miss something’, I’m right there at almost 1:30 a.m. watching late-night TV and fully knowing that I’ll have to be getting up at 6:45 a.m. to get ready for church. Sometimes I guess you CAN’T teach an old dog new tricks! Yesterday I ran into this yummy-sounding recipe on another recipe site and thought I’d pass it along. We don’t have Rueben sandwiches here very often (count that as maybe every 2-3 YEARS) and perhaps this recipe will increase the frequency; it sounds rather easy, also. Mix mayo, ketchup, dijon, and relish in small bowl and set aside. Line a large rimmed baking sheet with parchment paper (best not to skip this step). Unroll the bread dough onto parchment. Do not pat out, but do shape into an even rectangle as needed. Begin with short end facing you. Leaving a 1-inch border, stack the corned beef onto HALF of the dough. Place cheese on top of meat, place drained sauerkraut on top of cheese. Spread 1/2 to 2/3 dressing on top of kraut, saving rest for serving. Using parchment, fold dough down onto sandwich, pressing edges to seal. Bake approximately 20 minutes, until bread is golden brown. Remove and cool 5-10 minutes. Using a serrated knife, cut into 4 portions. Serve with additional dressing as desired. Tonight’s dinner is Homemade Pizza (or, as my husband said when reading my white-board where I write the week’s food offerings: “Her Majesty’s Pizza” since I’d abbreviated it HM Pizza). I guess I picked the right food for tonight because when asked ‘what’s for dinner tonight’ and giving my response, there were several “YES!” responses. My husband even said he was thinking of stopping at our local ‘fast pizzas for $5’ place and getting some for lunch after church, but then didn’t. I like making them because they aren’t that difficult and we end up with leftovers. I’ve discovered a ready-made pizza crust at Gordon Foods (where my son works); they’re 2 large crusts for $3 something and are just right: not too thin, not too thick (now I sound like Goldilocks!). Anyway, I digress . . . time to go ‘rest my eyes’ in my favorite recliner! Have a great afternoon and evening! Today has started out very quietly – just the way I like it! For a rare moment in time I’m alone in the house (with the cat) and pleasantly content. Last night was my knit group’s Movie/Knit-Crochet night and, though the total number of participants was low, we had a great time. Our host decided to make it a ‘picnic’ theme this time, so we feasted on hot dogs & all the ‘fixin’s’, baked beans, potato salad and homemade cherry cheesecake! I brought the movie “Calendar Girls” and the ladies loved it. If you’ve never seen this movie, I highly recommend it as it’s a true story of some ladies in England in a “Ladies Guild” who take it upon themselves to attempt to raise money for a good cause. It’s funny, touching (and at times a tear-jerker) but a great ‘chick-flick’. We all had a nice time and were totally ‘stuffed’ with great foods. Tonight is my special needs group and it’s also our ‘Business Meeting’ night. We bring in an excellent lady who is also a missionary and she teaches our kids songs and wonderful Bible lessons while we have our monthly business meeting. It’s a very quick night for us (the leaders) so it should go well. Hopefully, if all goes well, this will be a ‘quiet’ week – no big hassles or last minute change of plans . . . note I said: hopefully! I anticipate today being quiet: some clothes mending (popped buttons), a little laundry, some quiet knitting/sewing squares, and putting together a type of pork stir-fry over rice, using up the remainders of the pork roast for dinner. It’s sunny and in the 50’s right now; a beautiful Spring day. Hope you are having a pleasant day; remember to take a little time out for ‘you’ – if nothing more than just sitting down for a second, closing your eyes, breathing a few deep breaths (sort of like sighing) and thinking lovely, happy thoughts. You’re worth it!!! In a large pot filled with lightly salted water, heat water to boiling and cook spaghetti noodles according to pkg. directions. Drain, then add the melted butter and stir noodles to completely coat. Stir in Parmesan cheese, powdered garlic and herbs quickly while noodles are hot, making sure to evenly mix. You can use more cheese or garlic if you wish. (We like a lot of garlic and cheese; I tried to estimate the amounts above) Serves about 4. You could add a tossed salad to the above and have a great dinner. We ended up with leftovers – always welcome, as now I know what we’re having for dinner tonight! I kind of over-did the noodles last night and cooked about 1 3/4 box, so we’ve definitely got lots to spare! They’re very tasty and very filling; if you’re a cheese and garlic lover like me, you’ll like them. One ‘happy to know what’s going on’ Pammie here, enjoying the 70+ weather and finally taking her meds! YAY!!! This is one of the squares for my friend’s afghan; I would say that it’s the hardest thing I’ve ever knit, simply because it’s a line-by-line pattern whereby if you make just one stitch mistake it will definitely show. 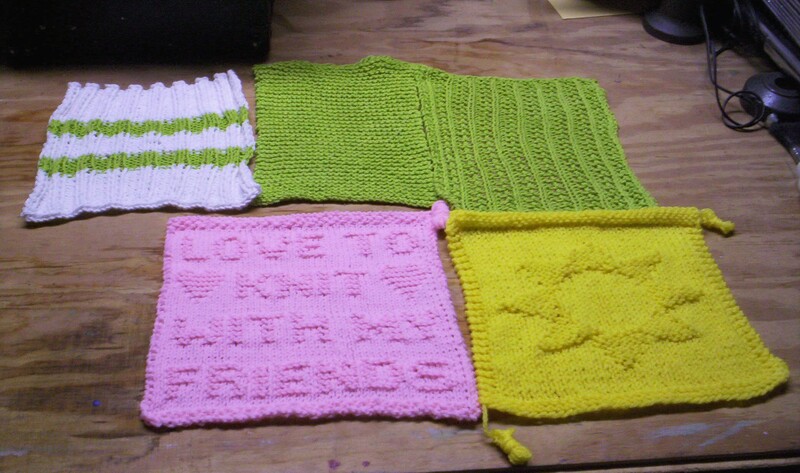 Below is another square I knit (a yellow sun) and three lime green dishcloths as part of her present from me. So far the ‘friends afghan’ project is coming along nicely; “Momma” reminded me to slow down on the squares I’m knitting to give the other ladies a chance to knit/crochet their own squares. I had to pass on her message to another of our members who thinks like me (“It’s fun, easy and we probably need more squares”); she has crocheted five squares. If each of the people who said they would make one (or more) square actually get them done, we will have a very nice sized afghan for our friend. Just happy the project is coming along nicely; currently our friend’s condo paperwork is being delayed a bit, so that might give us a little more time to get this done before she has her closing – hope so! The weather today is gorgeous – 84 degrees and very sunny! I thought my grandson would probably want to go play in the sandbox for the first time this year but right now he’s fully content playing with his toy train set and watching Spongebob. The flowers are all in full bloom; was thinking about picking a bouquet of daffodils, narcisus and a few forsythia branches earlier but never got around to it – maybe tomorrow. I also heard something about a possible FROST WARNING tonight? Yep, that’s Michigan for ya – if you don’t like the weather, stick around for an hour and it will change! (Just checked the weather report and it’s ‘chance of rain or snow Friday with low of 35 degrees, Saturday chance of rain or snow HIGH of 43’ … YUCK! Have you ever experienced just learning something that you might guess half the world already knew before you? That was the case today, but in a good way! Yesterday I made a trip to KMart and one of my purchases was a Spongebob Squarepants DVD (not for me – for my grandson, who loves it . . . and my guys who also think he’s funny) The box was marked $9.99; all the other SB videos were marked $12.99. I checked the various titles and thought this cheaper one had about the same amount of episodes, so I bought it. When I got home (as is my habit) I read over the receipt, only to find that they’d charged me $12.99, instead of the $9.99. I’m not always one to return something if there’s a mistake, but today was a bit different. While cutting out coupons, I happened on a “buy one – get one free” coupon for Head “n Shoulders shampoo and knew we were almost out. Figuring the $3 mistake on the video would just about cover a bottle of shampoo, I returned to KMart. The lady at the Returns desk was very pleasant and VERY chipper for 9:30 a.m. When we got to the part where she was going to give me the refund, I noticed she had a $5 bill in her hand, so I said: “Why are you giving me $5 when it should only be $3 and some change?” (You would have thought she’d changed into a pleasant little-old-lady at that very moment: she grasped my hand in her two and patted it, saying something about ‘benefits’ and refunds . . . I didn’t understand what she was talking about.) She explained that since I charged the original purchases on my bank card she couldn’t give me cash back but would be happy to give me a ‘in-store’ card with the return money on it which I could use for other purchases. Then she said something about “Federal Law . . . blah, blah, blah . . .something, something, something, so much percentage of the original price”. I still didn’t get it so she tried to make it much more ‘simple’ for me. I guess, boiling it down, if the price on an item is marked AND the store’s scanner charges you a different price, the store is required BY LAW to not only refund you the difference, but also a certain PERCENTAGE of that amount, also! What it all boiled down to is: I ended up with the $3.18 difference added back onto my card, PLUS a nice FIVE DOLLAR BILL! I promptly went to the aisle for the shampoos and was able to get 2 bottles of Head ‘n Shoulders, ($5.49 each) using my $5 AND the ‘buy 1/1 free’ coupon for a total spent of something like $3 for 2 bottles!!! YAY!!! BONUS! Guess it goes to prove that even if you are a bit ‘slow’ in knowing the ‘ways of the commercial merchandiser, you can still end up with a nice bonus! I didn’t plan it that way and yes, it was their mistake in pricing, but it’s sometimes nice to get a ‘little something extra’ to make your day a little sweeter! Spongebob video $9.99, 2 bottles shampoo for the price of one and then paying for that one bottle of shampoo ($5.49) with THEIR $5 dollar bill…SWEET!!! Today is one of those ‘catch up’ days; already been out and about to two grocery stores and the local hardware store. You know the larder is getting bare when you spend almost $150 and the only meat you bought is a tube of braunsweiger! Anyway, stopped at ACO hardware store to buy some greeting cards. “What?” you say – greeting cards? Yep! They sell very nice cards there 2/$1.00 ; I’d say their cards rival Hallmark any day and they have all varieties! Just a little ‘frugal tip’ for you, to make your day! Been spending time away from the afghans these past few days because I’ve started knitting the squares for my Knit Group friend’s afghan; have three done now. One is red with a heart in the middle – for all the love from our group; one is mint green with a heart and cross – for her love for her church, and one is peach with two smaller hearts – for her two daughters who are also ‘adopted’ members. I’m hoping that we get 30 (or more) squares from the other members so that it will be a good size for her. There are around 11 members who have said they’d knit/crochet one square and a few who said they’d try 2. My goal is to just keep knitting squares and see what happens. It’s fun to create ‘special’ squares for a special friend; for me, it’s a challenge because I’m not fond (at all) of knitting patterns row-by-row, but I’ll do it for her! Today is a wonderful, sunny day in the mid 50’s and I’m going to try to enjoy it to the fullest. Am going to go ‘pattern hunting’ on line later to see if I can find a few more ‘dishcloth’ patterns with hearts. It’s always lovely on a dreary, cold rainy day, to receive a call from dear close friends telling you they’re on their way over to visit you! AND, not only visiting, but also BEARING GIFTS! 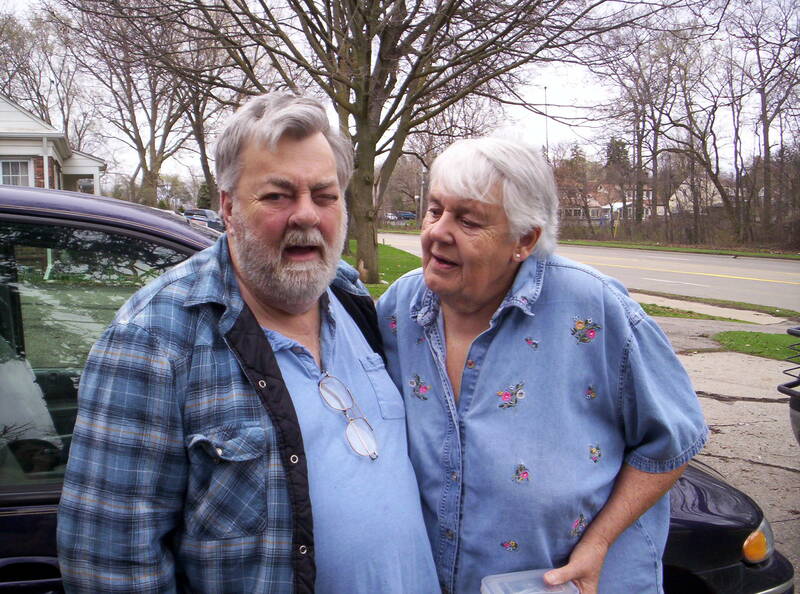 My dear friends Mary & Jay brought two jars of their homemade TASTY jam. These friends have become infamous for their various jams & chutneys; these flavors were: Michigan Apricot and Dutch Apple Pie. Now, over the years I’ve learned to look forward to these special people AND their treats, but I’ve got to say that their apricot is, by far, THE ABSOLUTE BEST! I thanked them profusely and do again, here. We’ve been friends a very long time; to my best recollection since around 1969; it’s truly wonderful to have friends with whom to have shared a great deal of my life and to have shared theirs, as well. Along with their company and the jams, they also brought 12 crocheted 12″ x 12″ squares for the Huron-Valley Optimists Club “Magic Hugs” squares program! Mary was the very first person to contribute squares to my Ghana Project and, true to her very generous nature, she also decided to participate in this great program! 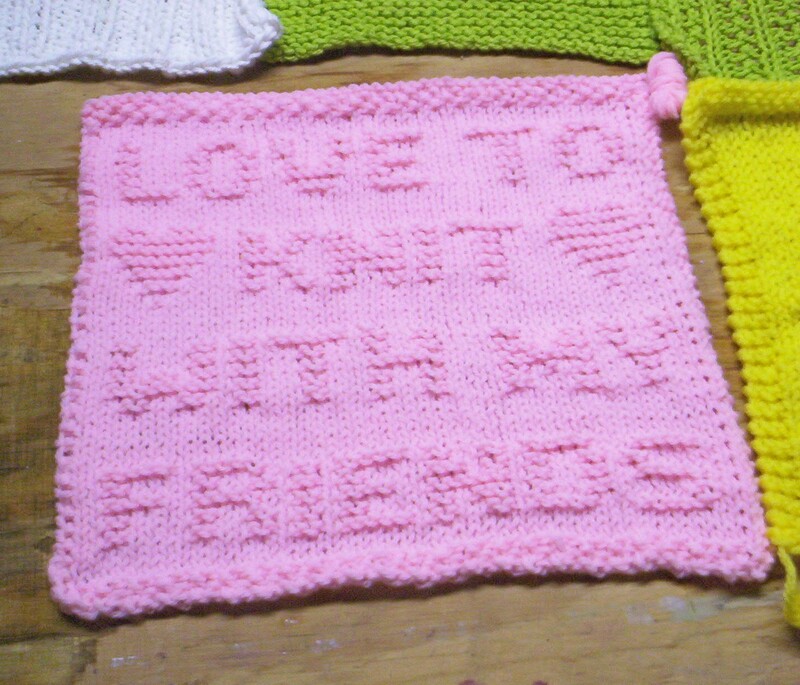 I told her that when I blogged about visiting the Optimists that perhaps I might knit some squares for them but never dreamed she’d ‘throw down the gauntlet’ and challenge me to meet her twelve squares as well! I will post the completed squares photo when I’ve finally knit (or crocheted) the rest of my twelve (right now I only have 4 done) and hers, as well. It seems that lately my life has sort of ‘picked up the pace’ a bit with added projects. First it was just getting back into sewing the squares together, then this Magic Hugs project caught my eye so I began knitting for that. A friend at church needed his very expensive hand-knit in Ireland sweater ‘fixed’ (he’s pulled out stitches in several places), so that’s waiting. 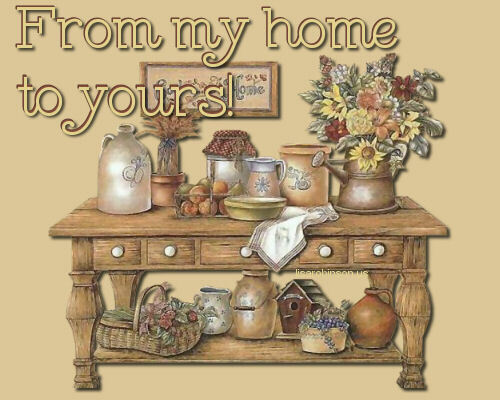 Yesterday one of the members of my knit group came up with another idea: one of our members is moving into her first ‘new place’ with her daughters very soon and the ladies thought it would be a great idea to gift her with something from all of us. The idea is that each of us knit or crochet a 10″ x 10″ square and I will sew them together and present it as a ‘condo warming’ present from our group. Well, you know where that’s going – another project to oversee and direct and, of course, I have to knit some squares for that too (can’t be left out you know!). That found me looking for patterns late last night and early today I began square #1 for this project. Found a really nice knit ‘heart’ pattern which I’m doing in bright red. It’s been awhile since I’ve knit anything following a pattern, so it’s taking a bit longer than I thought, but I’m enjoying it. The ladies thought that we would make this afghan in a sort of “Crazy Quilt” pattern: each one knitting up a square or squares in colors, yarns, patterns of their own choosing which would, hopefully, reflect our individual skills and personalities. So far there are 9 people who have said they want to knit/crochet a square, some who are probably going to do more than one. I’ve given them three weeks for a deadline because the friend still hasn’t got a closing date so hopefully we’ll have more than enough time to get it done. (will try to photo the completed afghan and post it here) That’s what’s on my plate lately as far as craft projects. Our weather has cooled off considerably these past few days, with high winds and rain for Monday and Tuesday. Today is in the 50’s and cloudy with expected FREEZING RAIN tonight…UGH!!! Not looking forward to that, for sure! There are now lots of daffodils, crocus, narcissus, and forsythia in full bloom all around the neighborhood – lovely signs of Spring (even with the cold temperatures). Hope that you are in good health and enjoying yourself at whatever projects you are doing – even if it’s only sitting and reading a book! Be glad for all the ‘moments’ in your life; I find myself looking forward to the quiet times when I can just sit and read or knit or even listen to a nice cd of Irish Celtic Harp music! Stay warm, enjoy yourself and SMILE a little! Life’s too short to frown too much!